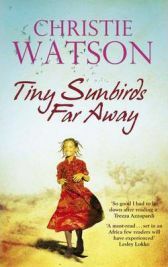 The storyline of Tiny Sunbirds Far Away is bounded by two major events, at the beginning and near the end of the novel. The first is the departure from Lagos, and then the ending is the culmination of everything which happens in between. Much of the novel is full of seemingly inconsequential events and day-to-day life, but it all builds up to a series of shocking conclusions. Blessing learns how to live without money, running water or the necessary oil to feed her brother safely – with an allergy to nuts, he can’t have food fried in groundnut oil, which is all that the family knows. Attending school is difficult, as fees are required for even the most basic and unpleasant local school. The hardships that Blessing must become accustomed to are presented through her eyes, a childs eyes. She has a fairly simplistic view on things, so we aren’t fully exposed to the struggle the family has. Similarly, the novel deals with a number of serious themes, including female genital mutilation and the kidnaps and gangs which are rife in the Delta, but these are clouded by the child’s view of them. Blessing fully understands everything which is going on, but the descriptions of the mutilation she sees in the course of her training as a birth attendant with her grandmother are muted, and at first it is not obvious what is actually being discussed. Her view of the gangs which terrorise the region, particularly the Sibeye Boys, are quite simple, that they are bad people. She doesn’t seem to feel the need to go into more detail than this. Having a child as a narrator makes Tiny Sunbirds Far Away less harrowing, which it very easily could be. This could be seen as a good or bad point: perhaps these events should not be muted, but on the other hand it does make for a more pleasant read while still highlighting the issues in the region. As well as the hardship and tragedy weathered by the family, there is also comedy. Blessing’s grandfather decides to take a second wife, Celestine. At first her presence is unwelcome, to both the family and the reader, but as time went on I realised she was light relief. Her antics and over-the-top emotions come off the page as if you knew her, and she often brings a smile, even in tragic circumstances. By the end of the novel, during a moving event, it becomes clear that she has been accepted and is now an important member of the family. Despite the poverty and the tragedy which befall the family, Tiny Sunbirds Far Away has a light feeling to it. It is not a difficult or time-consuming read, and I think this is due to the child’s narration and her sense of innocence and enjoyment in the world, even through everything her family suffers. Tiny Sunbirds Far Away is a moving and funny novel. While the novel may not teach you all the ins and outs of the situation in the Niger Delta, Watson treats the issues of life there with sensitivity. There is a “real” touch to her story and her writing, as not everything works out yet life still goes on. Many thanks to Quercus for providing a review copy of Tiny Sunbirds Far Away. One Comment on "Tiny Sunbirds Far Away"